Parents’ Incomes and Children’s Outcomes: Can Tax Policy Level the Field? In Lake Wobegone, the fictional Midwestern town that “Prairie Home Companion” radio host Garrison Keillor made famous, all children are above average — as new parents always wish. Sadly, that isn’t so in the real world, especially for children born to low-income families without sufficient financial resources to nurture their inherent abilities. But as a new research report shows, a fresh twist on tax policy might level the odds and pay dividends across the whole population, rich and poor. “Previous studies of how to set optimal taxes have typically ignored a crucial channel — the effects that parents have on their kids,” says Alexander Gelber, a professor of business economics and public policy at Wharton. He and co-author Matthew Weinzierl, a professor at Harvard Business School, mined new data and existing research for signs that taxes and ability are, in fact, linked. Their paper, “Equalizing Outcomes vs. Equalizing Opportunities: Optimal Taxation When Children’s Abilities Depend on Parents’ Resources,” marshals statistical evidence that supports the idea that increased financial resources for parents with low incomes can lift the performance levels of their children on standardized tests of cognitive ability. The researchers asked how this linkage ought to affect tax policy. Gelber’s and Weinzierl’s research builds upon existing evidence that choices by parents affect the abilities of their children, as measured in standardized tests of cognitive performance. The authors used data on 3,714 children and 2,108 mothers between 1988 and 2000. 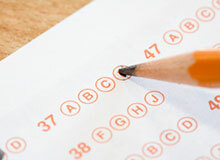 They considered how parents’ incomes affected children’s standardized test scores. Based on their findings, the study proposes ways to use tax policy to affect children’s ability levels. “Ours is the first paper we know of to model this complexity and derive policy implications,” the authors write. According to the model developed by the researchers, a resulting tax adjustment would affect children of all taxpayers, but not in equal measure. “Giving parents resources has a bigger effect on children among the low-income parents than among the high-income parents,” says Gelber. Bottom line: More disposable income means more chances to succeed for children in low-income families. Think of it this way, Gelber states. If the government were to distribute money randomly to some high-income parents and not others, overall results on upper-income kids would not change very much. In contrast, an identical distribution of cash to some low-income families would have much more pronounced effects on the cognitive abilities of their children, as intuition affirms. Boosting earned income tax credits (EITC) would provide the means to confer extra cash on low-income families, the researchers propose. Each $1,000 increase in disposable income for a given child should add two percentile points to that child’s ability levels as measured by national standardized tests. “It’s economically significant,” Gelber notes, “in the sense that gains in society’s welfare end up being substantial.” The empirical results suggest that past expansions of the Federal EITC, which now reaches almost $6,000 for some families, have had substantial effects on children’s cognitive scores, according to Gelber. The researchers suggest that society could reap gains without imposing commensurate penalties on high-income taxpayers. That’s because the mean ability level increases across generations. An optimal tax policy will supply the work force with more skilled workers. The net gain to subsequent generations exceeds a 1% increase in permanent disposable income, they write. Gelber adds a note of caution, however. While the researchers’ findings shed light on the need for an inquiry into existing tax policy, more research should precede concrete proposals. “What we’re thinking about is a step removed from real world policy making,” says Gelber. Important caveats include a concession that no existing data link how parents spend added income with variations in their kids’ outcomes. Nor do data exist yet to show the impact on income when children are old enough to join the work force. “We’re most interested in an abstract comparison between conventional tax policy and tax policy that recognizes some effects of parents on children,” Gelber says. All else being equal, when this force is taken into account, it could justify lowering marginal tax burdens on the poor relative to the well off, they argue. Even in a theoretical realm, such findings might rub a raw political nerve. Restive voters favor lower taxes, not more transfer payments — the net effect of lowering marginal taxes on low-income earners. However, Gelber remains optimistic that changes could take place, even in the current climate. Over the past three decades, he notes, Republican and Democratic presidents alike have increased EITC payments that transfer money to lower- and middle-income families. “We actually do see a win-win,” says Gelber. An optimal tax policy enables a greater share of the children of low-skilled, low-income parents to move up the skill ladder than does the status quo policy. “Even higher-skilled members of the current generation gain substantially, however, as the gains in efficiency and equality in future generations raise the current generation’s present-value welfare,” the researchers note in their paper. Thus, both low- and high-income individuals gain from a policy that takes into account the effect of parents’ income on their children’s abilities.